Score after 49.2 overs, India 234-3, Kedar Jadhav 61*, Dhoni 87*; Stoinis 1/60, Siddle 1/56, Richardson 1/27. Melbourne: MS Dhoni (87) and Kedar Jadhav (61) starred as they guided India to a seven-wicket victory against Australia in the third ODI here on Friday, thereby clinching the series 2-1. With this, Virat Kohli's men have also completed the 'double' after winning the Test series earlier. India lost Rohit Sharma and Shikhar Dhawan, but this was followed by a gritty fightback by captain Kohli (46) who missed out on a half-century in a rare occasion. however, things started working according to plan once Dhoni came to bat in at number four, thanks to his calm and composed innings along with Jadhav. 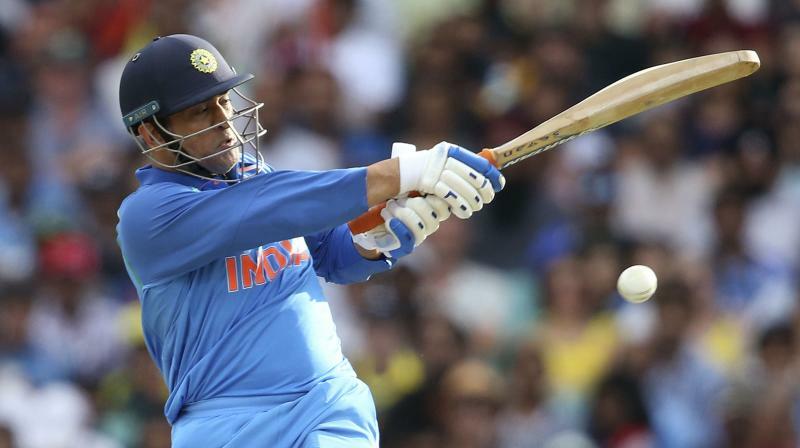 This was Dhoni's third ODI fifty in as many games on the current tour Down Under, and his 70th overall in the 50-over format. While Jhye Richardson finished with a spell of 1/27 from 10 overs, Peter Siddle and Marcus Stoinis' spells read 1/56 and 1/60 respectively. FIFTY! Kedar Jadhav brings up his 4th ODI half-century and it couldn't have come at a better time. India needs 14 runs off 12 deliveries now. FIFTY! MS Dhoni scores his third consecutive ODI fifty in as many matches in this tour. Overall, it's his 70th ODI half-century. EDGED AND GONE! Jhye Richardson gets the big fish Virat Kohli after the India skipper nicks it straight to the keeper. This will surely put more pressure on MS at the other end. WICKET! Soft dismissal as Shikhar Dhawan punches one back to Marcus Stonis on the drive. Marcus Stoinis with the big wicket of Shikhar Dhawan! WICKET! Rohit Sharma is caught at first slip by Shaun Marsh as Peter Siddle strikes. Yuzvendra Chahal picked up six wickets as India bundled out Australia for 230 runs in the third and final ODI here on Friday. Chahal finished with a spell of 6-42 from 10 overs. Peter Handscomb (58) top-scored for the hosts even as Usman Khawaja (34) and Shaun Marsh (39) fought hard for the hosts. Earlier, Alex Carey and Aaron Finch had bad starts as Bhuvneshwar Kumar picked up both the wickets. Bhuvneshwar finished with figures of 2/28. WICKET! Chahal gets his third as Rohit takes a catch at slip to dismiss Marcus Stoinis. WICKET! Double joy for Chahal as he sees off Khawaja for 34 runs. WICKET! Shaun Marsh is stumped by MS Dhoni as Yuzvendra Chahal strikes. WICKET! Bhuvneshwar Kumar gets his second as Aaron Finch is dismissed for 14. WICKET! A short-length delivery by Bhuvneshwar Kumar as Alex Carey finds Kohli at second slip. India have won the toss and have elected to bowl. The big team news is that Vijay Shankar makes his ODI debut as he replaces Mohammed Siraj. All eyes will be on Virat Kohli’s men when the visitors India take on Australia in the series-deciding third ODI at the Melbourne Cricket Ground here on Friday. After having lost the opening game by 34 runs, the Men in Blue responded in style in the second match thanks to a century by Kohli and a vintage MS Dhoni show. The Men in Blue have never won a bilateral ODI contest on Australian soil, and their only two series' wins in this format have come in 1985 (World Championship of Cricket) and 2008 (CB Series). In fact, this is only the second bilateral ODI series India have played in Australia, losing 4-1 in 2016 when they toured here last. Also, by winning this third ODI in Melbourne, India will finish the current 2018-19 tour without having lost a series here. They have previously drawn the T20I series 1-1, and then went on to record a historic first-ever Test series win here by a 2-1 margin. While India will take winning momentum into this third ODI, their only worry at the moment is the fifth bowling option. So far in the series, senior pacers Bhuvneshwar Kumar and Mohammed Shami have been impressive, while the two left-arm spinners Kuldeep Yadav and Ravindra Jadeja have provided control and breakthroughs in the middle overs. In the absence of Hardik Pandya, India have used a full-time seamer as their fifth bowling option both at the Sydney Cricket Ground and the Adelaide Oval. Khaleel Ahmed (0-55) and Mohammed Siraj (0-76) though failed to impress in their singular outings. Seam bowling all-rounder Vijay Shankar and leg spinner Yuzvendra Chahal are in contention and both had a rigorous workout during the optional training session on Thursday at the MCG. Australia have won nine out of the 14 ODIs played against India at the MCG, and it should inspire them on Friday as they are still on the cusp of winning their first ODI series since January 2017. Live telecast: The matches can be seen live on Sony Six (English commentary) and Sony Ten 3 (Hindi commentary). Live streaming: It can also be streamed live on Sony LIV, the digital platform on the internet.